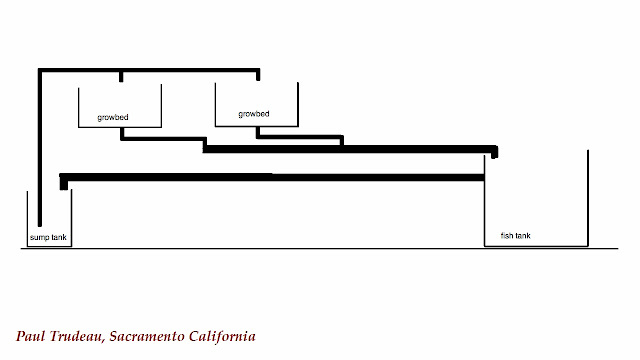 Got an email from Paul Trudeau from Sacramento California. His system using fish tank , sump tank for water feed and growbed. 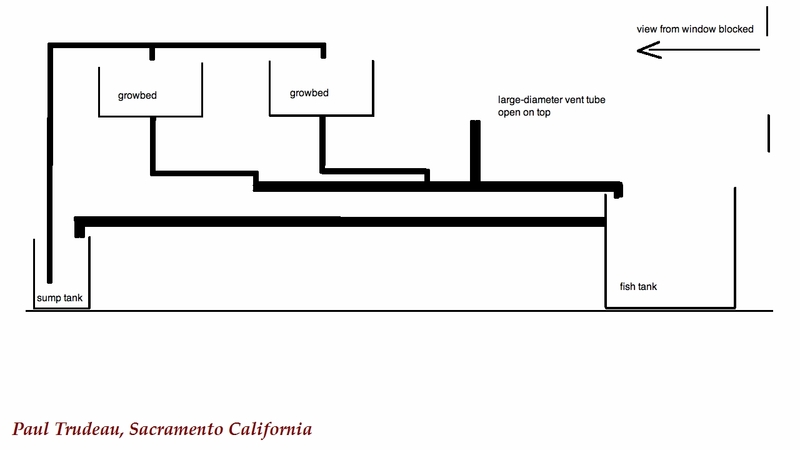 Water from growbed by siphon and gravity over a long tube back to the fish tank as illustrated below. 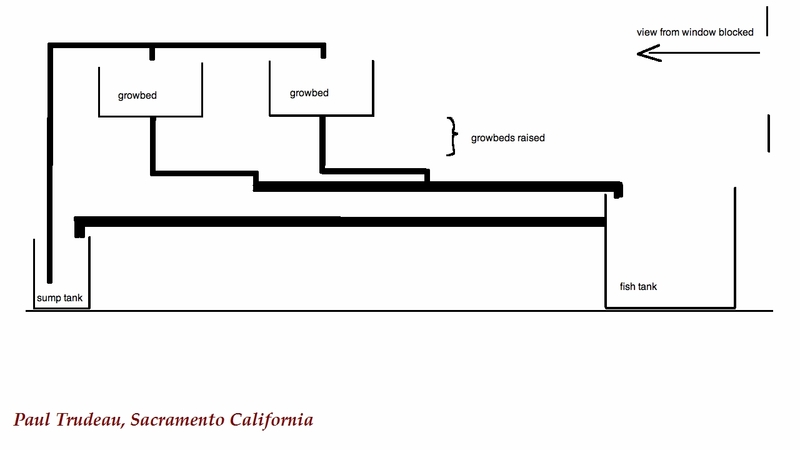 With this arrangement he experience problem with equilibrium flow, initially he raised the growbed to eliminate this situation but its not a pretty sight if the growbed is high. 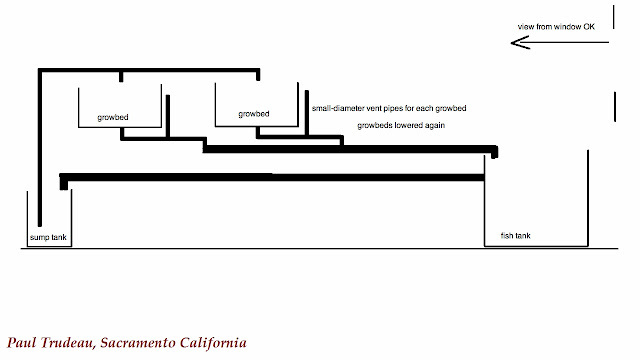 To address this higher growbed issue, he installed vertical breather on the long return tube. With this vertical tube he manage to lower the growbed back to original height with siphon working without problem as in picture below. This next picture is another variation of same, but at individual growbed. What happen in his set up with longer return pipes, water trapped within this pipe will cause additional suction and back pressure which will cause sustain flow (equilibrium flow) also water velocity would be slower due to this longer tube. Raising the growbed higher, helps by providing additional momentum to water due to the longer vertical. This would help overcome back pressure and increase water flow in the tube hence restoring siphon function. Having a breather in a long tube effectively the best option, what happen is the longer tube is broken into shorter length at that breather point, so effectively the siphon horizontal outlet is shorten. This also introduce air into the tube eliminating water back pressure. The longer tube need to be of a bigger diameter to accommodate water volume gushing from the growbed. Thanks Paul for sharing this information and if anyone have same situation, this is one way to address it.